Death, myths and correct heating protocols for Crested geckos. As most owners of any Rhacodactylus species will undoubtedly be aware, “room temperature” is “ideal” for species within this genus. Of course, this is suitably vague, but “room temperature” can be further refined as being between 70-80°f (21-27°C). This temperature is generally easy to maintain, and in most cases, does not require the use of any additional heat sources. While it is clear that this heating routine is relatively successful (in so far as there are large numbers of Rhacodactylus geckos kept and bred in the UK annually), I am not fully convinced as to its suitability for the sustained health, and performance of these animals. Thermoregulation, as you will all likely be aware, is the act of maintaining body temperature within given thermal limits in order for normal bodily processes to take place at optimal (or near optimal) efficiency. The key to successful thermoregulation then, relies on being able to heat and cool the body, according to predefined requirements, using available temperature gradients within the environment. This therefore means that unless your tank is set at the thermal optimal for your species (or indeed specific individual), then you must provide a thermal gradient, and allow the animal to thermoregulate independently. Failure to do this, will likely result in sub-optimal performance, which generally manifests itself as lower than expected appetite, reduced growth rate, impaired digestive ability and other similar symptoms. Further to this, it has been conclusively demonstrated that other nocturnal gecko species thermoregulate diurnally (Autumn & De Nardo, 1995 – Behavioural thermoregulation increases growth rate in a nocturnal lizard) and so maintaining them at temperature, which mimic their active period (i.e. the night time), is probably inappropriate. OK, so if we accept that maintaining the enclosure at a single temperature is not ideal physiologically for these species, then delimiting a suitable temperature gradient for these species becomes very important. Many of you will likely be aware of the suggestion that temperatures above 82-83°f (28°C) will induce stress, and possibly cause overheating and death for Rhacodactylus geckos (particularly mentioned for R. cilliatus, although this may simply be due to the numbers of this species kept compared to the other species in the genus). Given the ability of cold-blooded animals to cope with sub-optimal temperatures (both above and below optimal), I find it difficult to believe that a difference in temperature of less than 5°f (2°C) could potentially cause such problems to a species. For this reason I tested experimentally preferred temperature (Tp) in Crested geckos (R. cillatus) over a gradient ranging from 90°f (32°C) to 70°f (21°C) for 26 non-full sibling individuals. Somewhat surprisingly, given the claim of high fatality rate over temperatures of 80°f (27°C), Tp for this species was 86°f (30°C), and higher temperature was tolerated without issue. With this in mind, I decided that testing growth rate between individuals which were maintained at the generally recommended “room temperature” (in this case, a constant temperature of 75°f or 24°C), and individuals maintained with a diurnal temperature gradient ranging from their Tp of 86°f (30°C) to 70°f (21°C), and a nocturnal temperature of 70°f (21°C). Fifty two (52) hatchlings (with no genetic bias) were divided into the two test categories, and growth rate, along with volume of food eaten was recorded. All other environmental parameters were kept constant, UVb light (5%) was provided, and the food source was exclusively black crickets, appropriately gut-loaded and supplemented at every feed with Nutrobal. 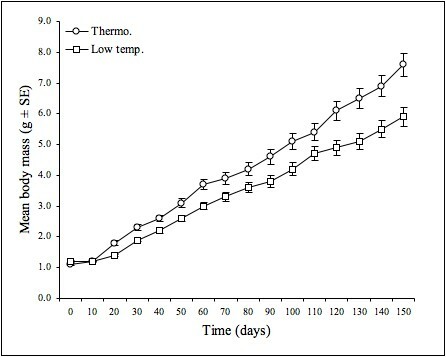 Figure 1: Mean body mass over time in captive R. ciliatus raised from hatching under two separate thermal conditions. Circles represent mean body mass of geckos allowed to thermoregulate at diurnal temperatures. Squares represent mean body mass of those maintained at constant nocturnal temperatures. Bars represent standard error. The results were pretty conclusive, and show that geckos maintained at a constant ‘room’ temperature (75˚f), grew at a rate of 0.047g/day, while geckos allowed to thermoregulate independently grew at a rate of 0.058g/day. The difference in growth rate is statistically significant (P = 0.002), suggesting that there is a real improvement in performance (measured here as growth rate) in the animals allowed to thermoregulate independently, compared to those maintained at a sub-optimal single temperature. The number of prey items consumed per individual was higher in the thermoregulating group, and because volume of prey consumed could be linked to mass of the animal, when we controlled for body mass, prey consumption showed no significant effect of treatment. So what do these experiments show, and how could they influence the way you maintain your Rhacodactylus species? Well, perhaps the most important finding, is that you must provide a thermal gradient for your animals. A single temperature maintained across the entire enclosure is inappropriate for any cold-blooded species, and maybe significantly affecting the performance (in this case, the ability of you animal to function at optimal capacity) of your animal. I am fully aware that the suggested ‘risk’ of overheating may not be fully removed by this experiment (although the evidence is very clear that the risk is unfounded), and so I am not suggesting that everyone simply increase their enclosure temperatures if they do not feel safe doing so. However, these finding should remove some of the worry over potential overheating with summer just around the corner. However, to clarify, raising the temperature across the whole enclosure is not ideal, as this also will not allow correct thermoregulation to take place. Montage_Morphs, purple-vixen, Jono2411 and 10 others like this. I upload photos etc first here before they are on the forum, also it is easier to contact me there as i am on there more than on the forum. You will also get to see the babies for sale before the whole forum does so it is worth your while! I'm not sure I understand, seems to be fine for what? Do you have a heat source creating a thermal gradient in the tank, or is the tank heated by the ambient room temperature? Without comparing both, how can you know which performs better, or if the animal is experienced sub-optimal conditions? Ah, just seen your edit. I'd be interested to know if you see any difference. very good read, well written and something to consider! i have no heat source at the moment and the animal in question eats the cgd fine but i will test out a heat gradient as i have a spare pulse thermostat should i use a ceramic or heat bulb if i am going to test this out? A very interesting article - thanks! Can I ask what heat source/enclosure was used in this research as there has been a lot of debate on here about mat vrs lamp. Would I be right in assuming, from these findings, that, in actual fact, the 'typical' crestie set up of a 45x45x60 exo is incorrect as it would be difficult to provide a thermo gradient? Also, is faster growth considered a better way to grow? There is a lot of evidence that shows in other species (including humans) that growing fast is actually detrimental to low term health...? Can I just ask too why you chose to feed a diet of just black crickets to them when the collective belief is that they live on fruit with the odd insect? So I just noticed your edit... I was clearly too eager to reply. Choice of heat source is entirely up to you, and both will have their merits. If you are currently happy with your current lighting regime, and your tank layout allows it, I would suggest going with the ceramic (obviously take the required precautions to avoid the risk of burns etc..). yes i will but an interesting point was made what tanks were used and which sources as i too have an exo terra and can imaging since it as an arboreal one that a thermo-gradient will not be as easy? Awesome right up, very to the point, and aids a belief of my own, Basking points are important, and should be used, even a gradient with only a few Celsius difference can make all the difference in behaviour and growth rate. Just out of curiosity, was humidity uniform?